This is the first year that I have latched on to the idea of using coupons as rewards. To be honest, I've never used them for fear that fifth graders wouldn't buy in to them. In the past, I've tried rewarding kids in many different ways. In my first three years of teaching, I think I spent more money on items for the prize bucket than I made in a week! Then I did the worst thing a teacher can do: I gave them candy rewards. Yes, I am sad to admit that I actually rewarded their actions with candy. Of course, this led to the inevitable, "Mrs. O, didn't I do a good job? Is it worth a piece of candy?" Excuse me while I cringe at the thought. I eventually let go of the prize bucket idea and the candy and kind of scrapped rewards altogether. I give students tickets. I bought a roll at Target at the beginning of the year and still have more than half of it left. I did not designate what they could do to earn it other than if we have a full day of good behavior, everyone gets one. This was one I thought was important. I told them that other than that, I would give them out for various actions in class, obviously only for positive actions and behavior. That actually keeps them on edge, because they are never quite sure when they will get one. I also told them that they are positively not allowed to ask for one at any time. Amazingly, this worked! We're four months in, and they have never asked me for a ticket. On 12/12/12, I also had the "12/12/12 fairy" leave 12 sets of 12 tickets in 12 spots in the room. Beware, this may cause a bit of chaos, but it was a total blast. I am already thinking of something fun for the 100th day, maybe hiding tickets in the school with different clues leading them to them or something along those lines. I will let you know! Students keep their tickets in a Ziploc bag in their desk. They are totally responsible for keeping track of them and if they lose then, I tell them there is nothing I can do. Flip Flop - Swap seats with a friend for a day. Pop! - Chew gum in class for the day. Move that mouse! - Get an extra computer rotation for the day. Furry Friend - Keep a stuffed animal of your choice at your desk for the day. Cool Cat in the Hat - Wear a hat in class for the day. iPad Learning - Use the teacher's iPad in class during computer time. The coupons range in price from 25 tickets up to 100. Then, I have baskets (all from the dollar store) set up with coupon amounts on the front. Inside each basket are different books. They are all from Scholastic, mostly purchased with points I've earned from book orders, though I throw in a few bucks here and there, but nothing to seriously break the bank. 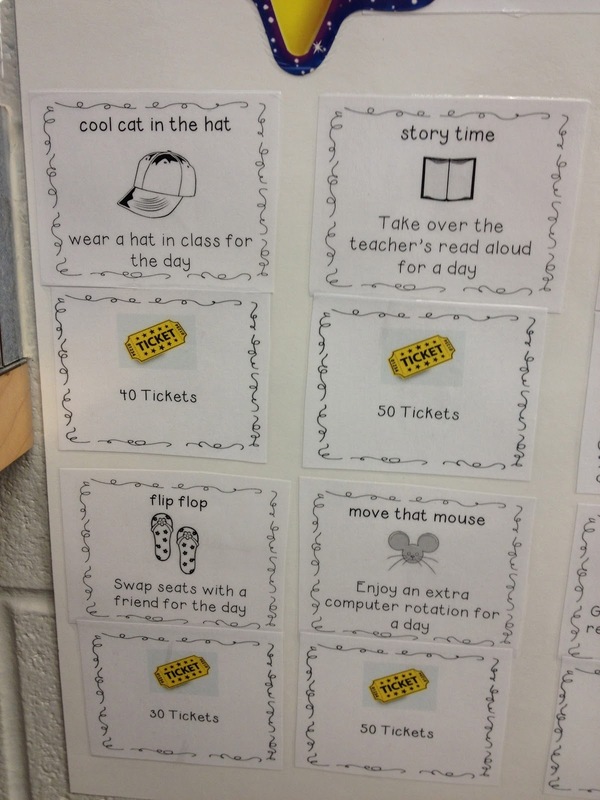 So the students LOVE this reward system! The most popular coupons are stinky feet and flip flop. The most popular book items are always journals or diaries or anything related to Diary of a Wimpy Kid. To be honest, my students are more apt to just use the coupons, but I am happy that when they do choose a book reward they are getting an item that will enhance their reading or writing in some way! I am so glad to have come up with this system, a melting pot of other wonderful ideas that has created a positive, affordable system that the kids in my classroom thoroughly enjoy! I plan to add more coupons in about midway through the year. If you'll notice, the items I posted have some really great ideas that I would love to add, but for now my students are quite content with what's being offered and that makes me a happy teacher!